Over the past four decades, the Healthy Communities movement has transformed traditional definitions and approaches to health. Philanthropic organizations, nonprofits, and government agencies—driven by the disconnect between health spending and health outcomes, the growing awareness of the importance of the social determinants of health, and the need to address poverty as a means of improving health—are leading efforts to ensure that good health is happening where we live, learn, work, and play. This article draws upon an environmental scan of 38 Healthy Communities demonstration programs and provides an overview of the history, progress, and future implications of the Healthy Communities movement. 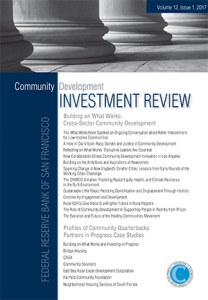 This was published September 12, 2017 in the Federal Reserve Bank of San Francisco’s Building on What Works: Cross-Sector Community Development journal, Volume 12, Issue 1.